Using weights obtained from over 100,000 Northern California babies, a new study is the first to detail the weight loss patterns of exclusively breastfed newborns. The results show that some breastfed babies lose weight faster and for a longer period than was previously recognized. The investigators have captured their findings in an online tool that is the first of its kind to help pediatricians determine whether exclusively breastfed newborns have lost too much weight in the first days of life. The research, Early Weight Loss Nomograms for Breastfed Newborns, is published today in the journal Pediatrics. Women do not immediately produce high volumes of breast milk in the first days after childbirth. Instead, mothers at first secrete small amounts of colostrum, which contains high concentrations of nutrients and antibodies for the baby. During this period, almost all babies experience some initial weight loss, which can cause concern from new parents and sometimes even pediatricians. According to the researchers, most newborns tolerate this initial period of weight loss. However, some do develop complications such as dehydration and hyperbilirubinemia – jaundice caused by too much bilirubin in the blood – which are the two most common causes of newborn hospital readmission. Mothers sometimes believe this weight loss means their baby is not getting enough breast milk, leading them to supplement their baby with infant formula, a practice pediatricians hope to avoid when possible. 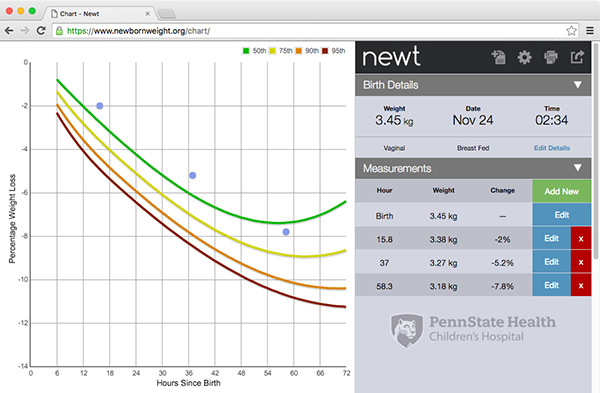 The Newborn Weight Tool, or Newt, was developed using a sample of hourly birth weights from more than 100,000 breastfed newborns at Northern California Kaiser Permanente hospitals between 2009 and 2013. The tool plots a baby’s weight percentile at any given time in the first few days following birth and compares it with the large sample of newborns. Until now, there was no graphical depiction or “growth chart” of early weight loss for exclusively breastfed newborns to help inform mothers visually of how normal it is for babies to lose weight, but now mothers and pediatric healthcare providers have a tool to demonstrate normal weight loss patterns. An individual mother can see how her newborn compares with these normal patterns, which in most cases will be reassuring. Newt was developed by the study’s senior author, Dr. Ian Paul, professor of pediatrics and public health sciences at Penn State College of Medicine and pediatrician at Penn State Hershey Children’s Hospital and Eric Schaefer, M.S., a statistician at Penn State College of Medicine, along with researchers at UCSF and Kaiser Permanente. 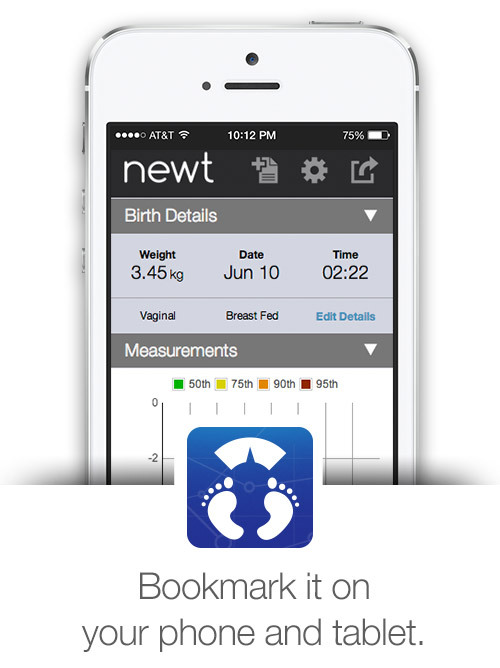 The tool is available for free at www.newbornweight.org, and healthcare providers can bookmark it on their computers, smartphones and tablet devices. It was designed for health care professionals to share the information with parents similar to the way growth charts are used now. The normal amount of weight loss depends on how many hours old a baby is. The study was funded by the U.S. Department of Health and Human Services, Health Resources and Services Administration, Maternal and Child Health Research Program and the National Institute of Child Health and Human Development. Support for the online tool came from Children’s Miracle Network at Penn State Hershey Children’s Hospital. Co-authors of the paper include Eric Schaefer, M.S., Penn State College of Medicine; Michael Kuzniewicz, M.D. M.P.H., of UCSF Benioff Children’s Hospital San Francisco and Kaiser Permanente Oakland, and Sherian Li, M.S. and Eileen Walsh M.P.H., R.N., of Kaiser Permanente Oakland. 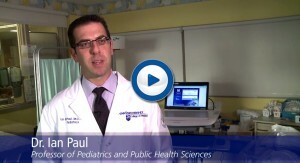 Hear a podcast featuring an interview with Dr. Ian Paul about the Newborn Weight Tool (Newt). View a photo album with downloadable high-resolution images. Penn State Hershey Children’s Hospital is the only children’s hospital between Pittsburgh and Philadelphia fully equipped to treat the most severely ill children of central Pennsylvania, with both the highest level neonatal intensive care unit and a Level I pediatric trauma center. Our physicians and nurses provide comprehensive support and specialized care to infants, children, and adolescents every day. With a focus on providing first-rate health care to all children, from those with complex heart disease to childhood cancers, the Children’s Hospital allows patients to receive the full spectrum of highest quality care close to their homes.